JVC HAFX5 Gumy Plus Review - Are The Cheap Earbuds Good for You? JVC HAFX5 Gumy Plus Review – Are The Dirt Cheap Earbuds Good Enough for You? Are the under $10 in-ear headphones good enough for you? JVC HAFX5B Gumy Plus in-ear headphones make an unbeatable offer. For a dirt cheap price, you get reliable and comfortable earbuds with decent sound quality. Decent earbuds under $10 are hard to find since “cheap” usually means bad quality. That’s not the case with Gumy Plus (hence why they are so popular). If you need a budget pair of in-ear headphones (you can even use them for sports) that look cool and work as intended, read on. Packaging is as simple as it gets. First of all, the earbuds have an ergonomic shape that fits great for most people. The silicon earbuds feel soft and stay in the ear because they are very light. This means they won’t fall off easily when moving. As a result, you can use them for running or other sports without problems. 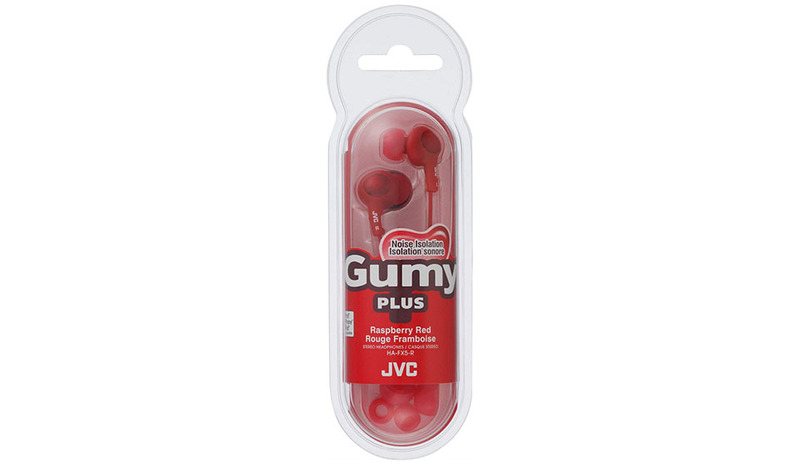 Even if you have funny ears and usually have a problem finding comfy earbuds, you should check the JVC Gumy Plus. Overall, the comfort is excellent, and you should feel confident these will fit you well. Find out how to improve the comfort of in-ear headphones. There are three different sizes of silicone ear tips to choose from large, medium and small. They sit firmly in ears and don’t budge. We can recommend them for sports even though they aren’t officially sweat-proof. Because of the design, you won’t have a problem distinguishing between the left earpiece and the right earpiece. There’s only one way they fit. Nonetheless, on the upper housing, you can find the side markings to make it even easier. 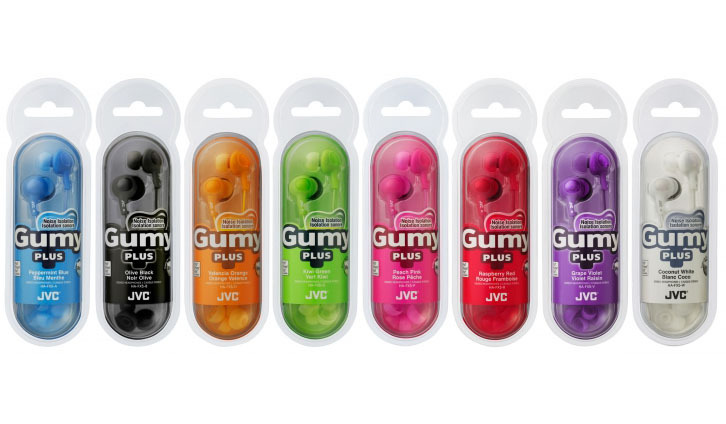 JVC Gumy Plus are not active noise cancelling but have decent passive noise isolation. (What’s the difference? See here.) Just make sure the silicone earbuds fit you, so you get an air-tight fit. Furthermore, the cable noise is slightly noticeable from the divider up but not a big problem. If it bothers you, use a clip, (not in the package) but you probably won’t need it. The housing of the headphones is made of plastic and soft rubber in different colors. JVC Gumys Plus are durable enough to withstand everyday use and even sports. As long as you keep them away from water, they should justify the price. Connection for your device is standard straight 3.5mm plug. It comes in the same color as the headphones, and it’s gold-plated. Also, it’s well-protected against straining. The cable is protected with thicker plastic so it can withstand some abuse. Unfortunately, it’s not tangle-free, but that’s not a usual feature for budget headphones. We noticed some commentary about them falling apart shortly after opening. Thankfully, it’s not a common occurrence (after doing more in-depth research). Ours held up fine, but it’s hard to measure durability on one case. In the end, the JVC Gumy Plus should serve you for a long enough time considering the price and you shouldn’t experience more failures than with comparable models. The only thing worth mentioning is that they come in various colors. There are many to choose from; black, white, blue, green, orange, pink, violet and red. The whole rainbow to fit your style, we like the choices. You can choose from many brightful colors. The color of the ear tips is the same as the color of headphones which is a nice touch. Headphones come with three pairs of ear tips (small, medium, large) and in the same color as the headphones. This is everything you get. Remember, you did get them cheap. Furthermore, the headphones come in a plastic box which you will need to cut open. After opening, the packaging becomes trash. The first thing that you notice is that they have enhanced bass and highs. Therefore, they have a V-shaped sound signature with high lows, muffled mids, and enhanced highs. Perfect for those who enjoy electronic music. Also, the sound is vibrant enough to enjoy all kinds of music. The audio quality in our opinion is about average but good for the price. This isn’t necessarily a bad thing since most earbuds at this price don’t sound so well. Nonetheless, you will enjoy the JVC Gumy Plus for most music genres. Furthermore, the soundstage is about average. Not that we expected more for this price. You can’t complain about average positional audio when you pay less than $10. Also, sibilance (harsh highs) is negligible and isn’t a big concern. 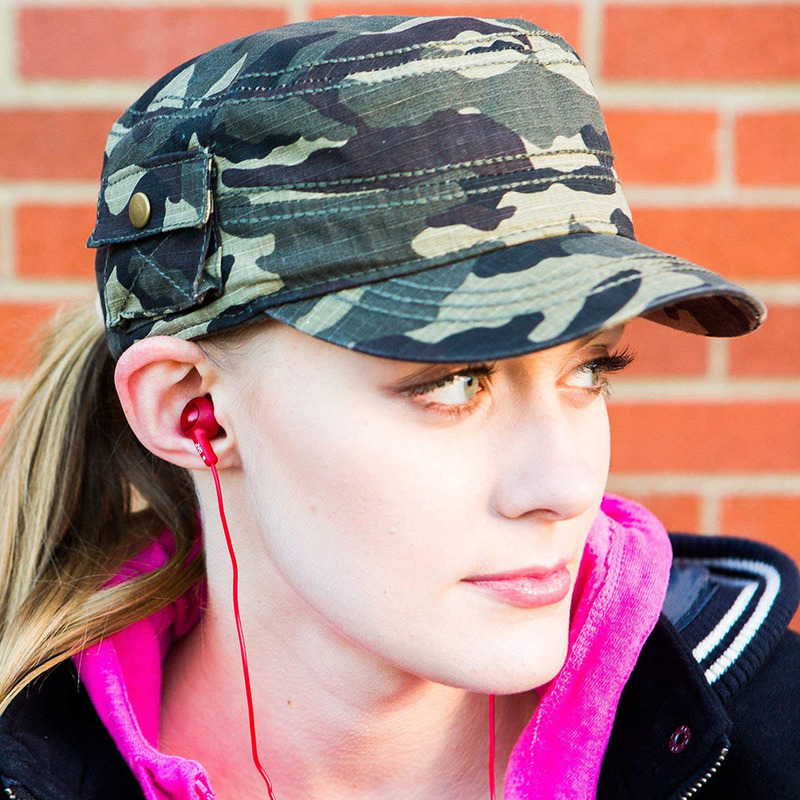 In the end, the JVC Gumy Plus are one of the best dirt-cheap in-ear headphones right now. With great comfort, dependable build-quality and satisfying audio quality you won’t get more from most under $10 earbuds.